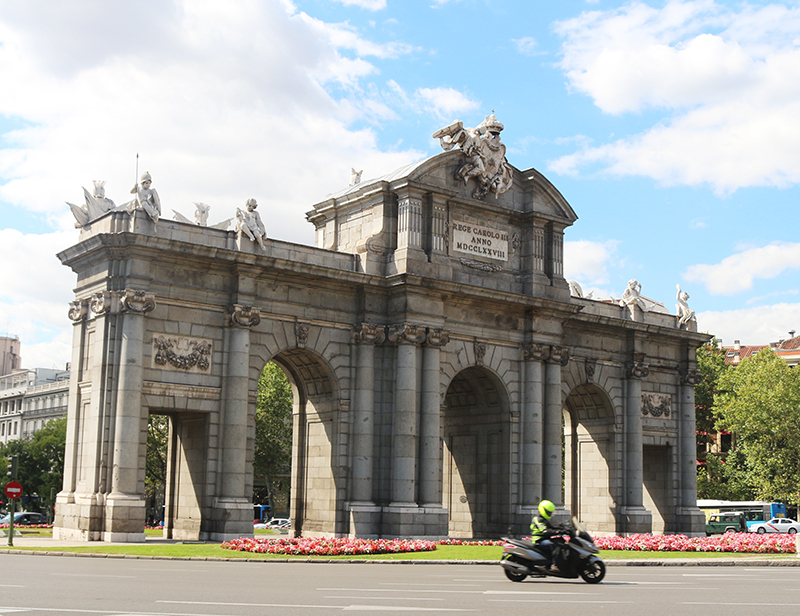 Last summer, I wrote a very brief holiday post on how being unprepared for our Spanish adventure, actually ended up being more relaxing than if we had been prepared. As I scrolled through posts on Spanish food snacks during last week’s #tapasday hashtag, I realised I hadn’t actually written anything at all about what we ended up doing. There had been so much happening with both Mo and I in the lead up to going away we hadn’t even had a chance to register that our holiday was creeping up. The fact that we actually made it to the airport on time with any form of luggage was probably down to sheer luck more than anything else. I remember us both falling into our plane seats and just exhaling huge sighs of relief that we were both there. 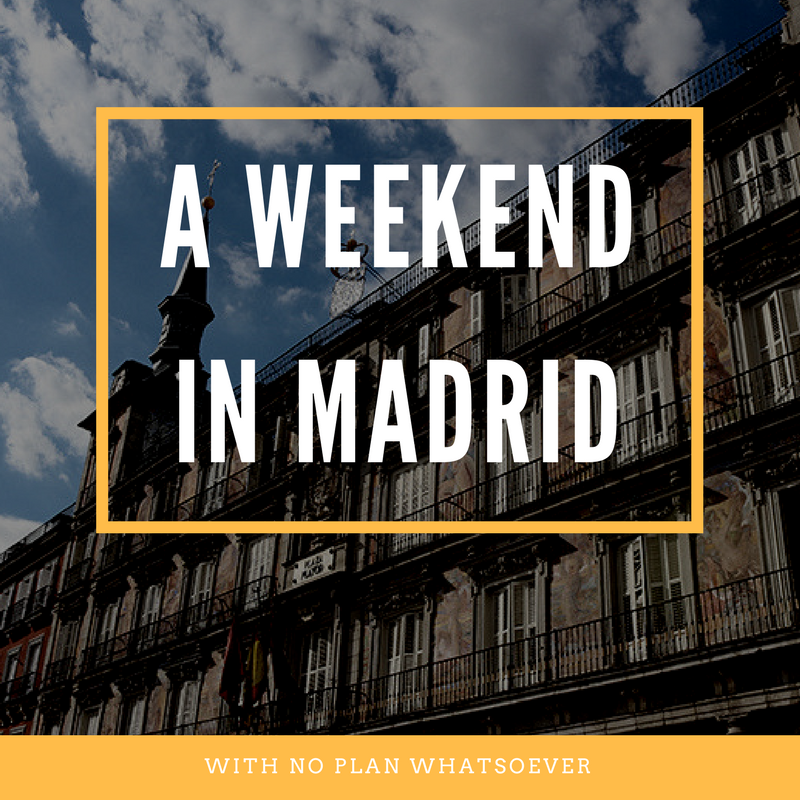 This was going to be a multi-stop trip, starting with Madrid where we had planned to stay for the weekend before driving down to the beaches on the south coast of Spain. So, the plan was to have no plan. We were just going to wander the streets and see where the ebb and flow of the city took us. Usually, this would fill me with immense sadness. Anxiety. Distress. I suffer from serious FOMO (fear of missing out) especially when traveling and never like to visit a destination only to miss out on some of the most famous sights. But this time I strangely didn’t care. It was so refreshing to throw the guide book out the window and think on the spot about what we wanted to do. I’m such a control freak, I regularly put Mo through lists and schedules when it comes to every day life, I think taking this planning time-out was a refreshing break for him too (I’m sure he’d be nodding furiously if he read this). 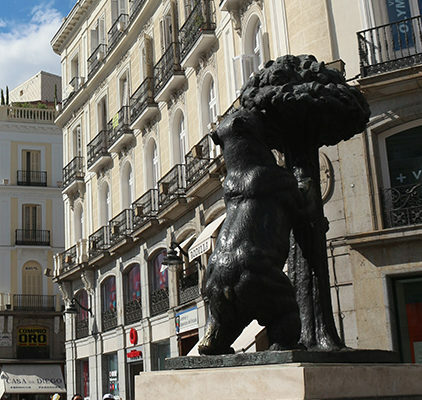 We came across the Museo del Prado and took the opportunity to explore some classical art, especially the work of the infamous Francisco Goya, one of the most celebrated Spanish painters of the 18th century. Perfect for shopping, window browsing or architecture admiring. My favourite part of the whole entire weekend was Retiro park. After strolling through the shaded tree-lined paths we stopped to enjoy lunch outside in a café overlooking the lake. After filling up on Spanish snacks, we spent time taking it in turns to row up and down the lake, soaking in the sun, having a laugh, enjoying the music from the buskers. There was such a great atmosphere and not having anything else planned meant we had nothing else on our minds and all the time in the world. There was a lovely exhibition on inside the crystal palace which was interesting, all about old school visual equipment. Such a great use of the space. If you get a chance, go have a nosy inside, a rainforest type treat awaits! 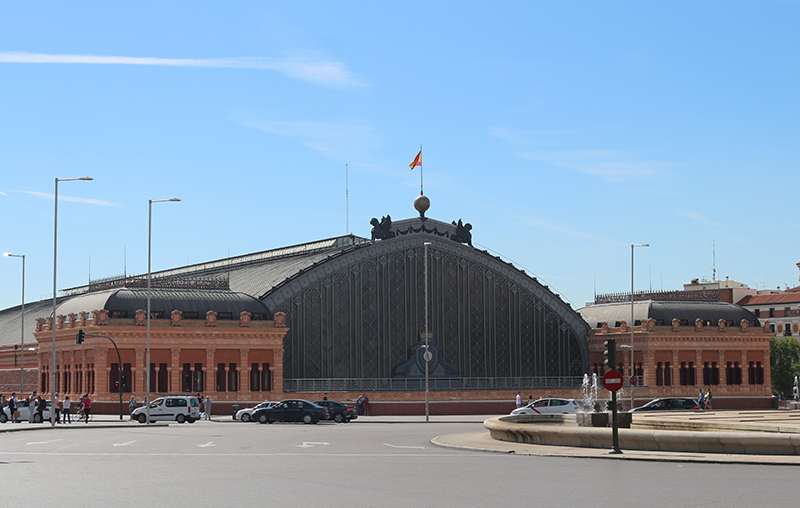 There are so many beautiful buildings in Madrid, I could have happily walked round for hours just admiring them. 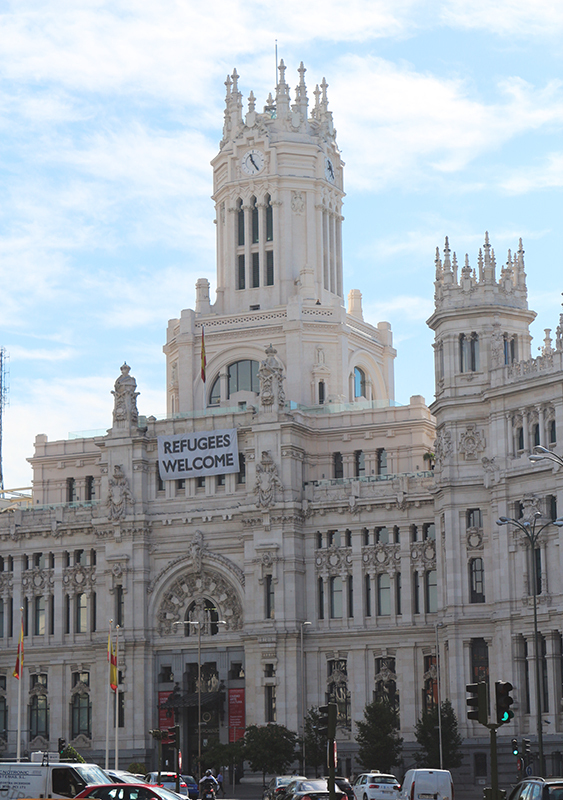 We walked down the Gran Via all the way towards Banco Espana and back to the other side by the palaces too. We covered as much ground as we could on foot, stopping for tea and coffee along the way. I loved stopping here for a snack and a drink in the sunshine. The restaurants were brimming with customers and the street entertainers were out in full force. He is there I assure you. Sorry bear, I realise this isn’t a very flattering angle. He was a lot smaller than I expected him to be. Recalling our trip back, I just realised I told a bit of a lie. We did have one thing pre-planned! It was a flamenco show at Corral de la Moreria. Watching dance is something Mo and I both love so when we first booked the trip Mo made sure to find the best traditional show in town. I highly recommend it! The venue takes you back in time to the original tablao flamenco. So popular with locals and tourists, I definitely advise booking in advance. Of course this type of holiday doesn’t always work, especially if you’re not travelling solo. Luckily Mo and I were both feeling the same way so we didn’t have to deal with that annoying indecisiveness when the other has no clue what to do. Keep some kind of map handy, one of those free tourist one’s are great as they helps you keep to the popular areas where you’ll be sure to find something to do, should you wish to of course. We also used google maps, but only whilst trying to navigate ourselves home or if we were looking for halal places to eat. If there are a few things you have in mind that you want to do at some point, but don’t want to be tied down – always check the opening times. Some places close on certain days or have varied opening hours. If you’re hungry – just eat! Don’t go walking around thinking you’ll find something better. If you’ve not planned anything it’s always best to just go for whats around you at the time. Keep walking around you could be making the situation worse and if one of you suffers from hangriness it’s not ideal. Are you a planner? Or do you prefer to wing it on holiday?